Although a stair-treadmill ergometer sounds like a high-tech piece of exercise equipment, it is actually another name for a stair climber or stepmill. An ergometer is an exercise machine that can measure your work output. A stair-treadmill is the combination of a standard stepper and a treadmill. The result is a stepmill. A regular stepper consists of two hydraulic pedals that you push up and down as if you are climbing stairs. A stair-treadmill, or stepmill, combines the stepping action of a stepper and the tread belt of a treadmill. The tread belt on a stepmill covers a set of stairs that rotate through the machine. You walk up the stairs as they travel downward. It is similar to walking up an escalator that is traveling down. Stair-treadmill ergometers provide an intense cardiovascular workout. You can adjust the speed at which the steps rotate to increase or decrease the intensity of your workout. If you usually use a treadmill, elliptical or stationary bike for your cardio exercise, you'll find that a stair-treadmill can offer you a more challenging cardio session and an intense lower-body workout. If you are not used to climbing stairs, it may take some time for you to build your stair-climbing endurance. An ergometer measures your work output. A high-tech ergometer might measure your blood pressure and oxygen uptake, but a basic ergometer is a piece of fitness equipment that provides basic workout data, such as your exercise time, distance traveled, calories burned and speed. A stair-treadmill ergometer is a stepmill with a console that displays information about your workout. Some machines also include a heart rate monitor and a fitness assessment program. Although a stair-treadmill ergometer can provide an intense cardiovascular workout, you will decrease the effectiveness of the machine if you do not use it properly. Stand upright, and only use the handles if you need to balance. Leaning on the handles decreases the number of calories you burn during workout sessions. 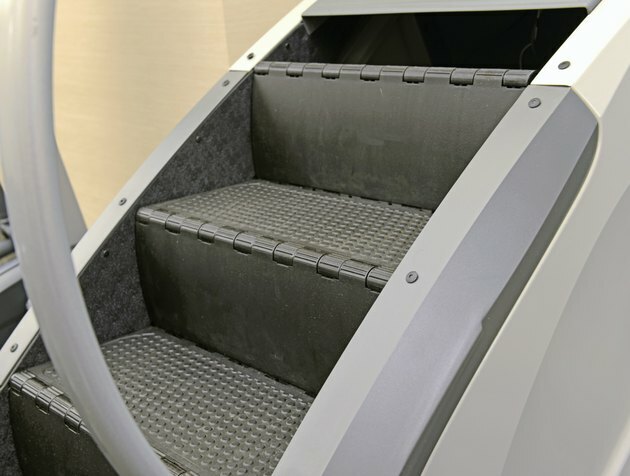 If you have any knee or hip problems, a stepmill may aggravate your condition. Check with your physician before using a stair-treadmill ergometer.